Wolverine Sign employees have given back to their community in a variety of ways over the years. 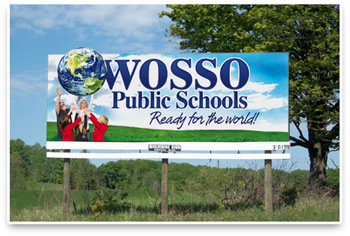 Employees have served on the Owosso School Board, served as Board Chair of the Shiawassee Regional Chamber of Commerce, Shiawassee Economic Development Partnership, Shiawassee Valley Development Corporation, Shiawassee YMCA, Respite Volunteers, Beta Sigma Phi Sorority, Shiawassee Convention and Visitors Bureau and the Shiawassee United Way. Employees have been members of the boards of the local Salvation Army, Owosso Rotary Club, Owosso Jaycees, Owosso Community Players and the Steam Railroading Institute. The company has sponsored local youth sports teams, theatrical productions, and other community events. Wolverine Sign also donates public service advertising space and other in-kind gifts to a number of worthy organizations. Wolverine Sign principals have served as board members at state and national outdoor advertising trade associations. Current president Paul Cook is a member of the OAAA Board of Directors and Legislative Committee, and is board president of the Foundation for Outdoor Advertising Research and Education.